We all know that Bagru hand print has always been loved by generations. 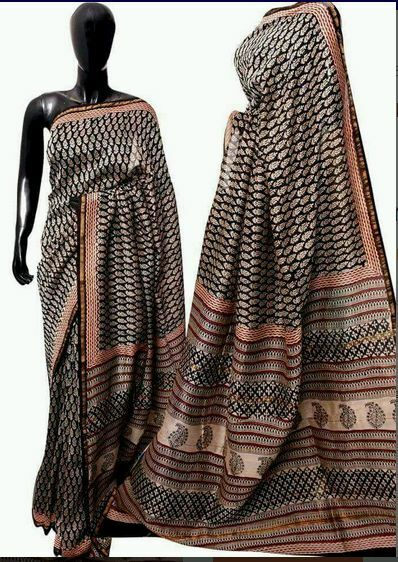 Hence, in order to meet the continuous rising demand of our fashion-conscious clients, Bagru print chanderi sarees manufacturer in Jaipur are dedicatedly engaged in manufacturing printed chanderi sarees of varied designs. Exclusively designed in vibrant colors and styles, these sarees are ideal to be worn by any ladies irrespective of any ages. As our continuous focus lies in offering the premium quality materials to our clients, hence, we as a Bagru print Chanderi sarees supplier are tremendously gaining prominence in the market. All the sarees are being designed with our skilful workers in order to get an immaculate quality.